This year there are 2 Noordhoek Judges with their own claims to fame- Franck Dangereux and Justin Bonello. Cape Town foodstylist and photographer Sam Linsell will need to keep the gender balance and make sure there is no neighbourhood bias! Justin Bonello: Presenter and producer of the international hit television series Cooked, which is his own cooking and travel show will be one of the judges this year. He has also been the host of the SABC3 reality competition The Ultimate Braai Master so well qualified to judge a good potjie! Franck Dangereux: Chef Franck needs little introduction to Noordhoek Farm Village as executive chef at the Foodbarn. Born in France and born into food, trained at Hotel School in Nice and apprenticeships at various Michelin starred restaurants, La Colombe at Constantia Uitsig and then his own familiar restaurant the Foodbarn. Sam Linsell: Sam is a food stylist, food photographer & recipe developer. She runs the popular Blog Drizzle & Dip and is the author of a fabulous cookbook of the same name. She loves hunting down the delicious things in life and having fun. National Braai Day and Heritage Day are on Tuesday 24th September and Noordhoek Farm Village celebrates both occasions on this proudly South African National Holiday by hosting the annual potjiekos challenge at the village. 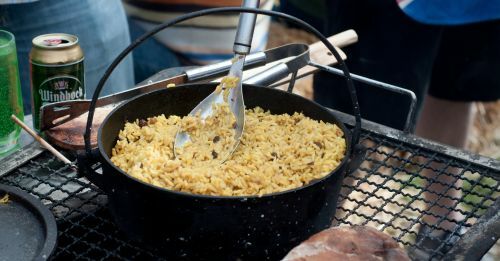 Entrants challenge The Foodbarn, Cafe Roux and the Toad in the Village to make the perfect potjie over an open fire. Visitors to Noordhoek Farm Village will be able to sample the potjies in eco-friendly containers for R20 a portion. Proceeds from these sales will go to a local charity: On the Verge. This amazing initiative is run by Kathy Fish to clear and beautify the verges in Noordhoek, so come along to join the fun, submit a team entry or simply eat some delicious potjie and support the project. Proudly South African or Heritage Dress-up is encouraged. Time: Fires ready from 10h00; Final Judging 16h30. This entry was posted in Cause, Entertainment, Holidays and Special events and tagged Braai Day Cape Town, Heritage Day, National braai day, Noordhoek events, Potjiekos Competition, potjiekos Noordhoek, whats on in noordhoek. Bookmark the permalink.